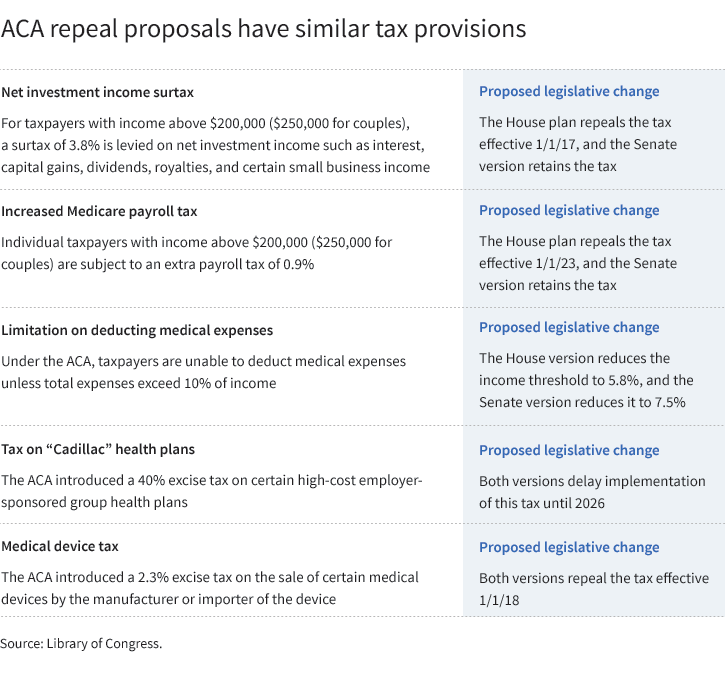 Tax relief and the elimination of health insurance mandates could be realized if current proposals to repeal the Affordable Care Act advance on Capitol Hill. There are many similarities between the House-approved American Health Care Act and the Senate’s Better Care Reconciliation Act, which is a work-in-progress. Areas of common ground could be an advantage to the bill if it receives Senate approval. Both proposals call for fundamental changes to the current individual health insurance market, including elimination of the individual and employer mandates to purchase and maintain health insurance coverage or face a tax penalty. The proposals would also replace the current premium cost subsidies with refundable tax credits, and would transition Medicaid from a federal matching program for state funding to a system based on a per-capita calculation. In addition, the proposals would make changes to certain taxes associated with the ACA. Additional taxes on health insurers and pharmaceutical manufacturers would also be eliminated. Other provisions would remove certain limitations on health savings accounts (HSAs) and flexible spending accounts (FSAs), including removing the restriction on the use of these funds for over-the-counter medications, lowering the penalty on non-qualified distributions from HSAs to 10% from 20%, increasing contribution limits for HSAs, and eliminating the annual contribution limit for FSAs. Although the Senate has yet to pass its proposal, individuals should monitor developments in health-care reform and discuss with advisors any potential impact on their tax situation or overall financial plan.